I absolutely loved The Fifth Season when I read it a couple of weeks ago – it made my top five books of 2016 despite reading it in late December. 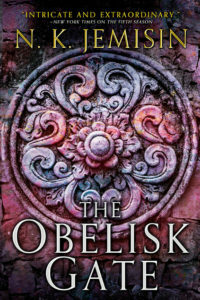 I immediately requested a review copy of The Obelisk Gate, and the fantastic Ellen Wright of Orbit (who also happen to be thanked profusely in the acknowledgements of this book) got it to me very quickly. I’m avoiding spoilers for both The Fifth Season and The Obelisk Gate in this review, which is going to be a little tricky. At the end of The Fifth Season, we (and Essun) find out a little about what exactly is wrong with the world of the Stillness. The Obelisk Gate picks up pretty much exactly at that ending. We get a couple of new viewpoints – Schaffa, Syenite’s former guardian, and Nassun, Essun’s missing daughter who has been through more in a year that a person should have to bear in a lifetime. We delve more into the world of the Stillness into this book, Essun isn’t as focused on her grief since she’s had some time to process things, and she’s lost Nassun’s trail. Her purpose changes, and she finds a community and starts paying attention to the wider world again. It turns into a more conventional (but still excellent) fantasy story – politics, alliances, defending your home from a threat, figuring out how to save the world. Nassun and Schaffa’s stories explore other plans for the world that are being made in parallel to Essun’s story, but have the potential to establish even more conflict. This world is utterly brutal, and it’s shaped the people who live in it to be pretty monstrous as well. I’m not usually a fan of protagonists who commit heinous acts, but even though all three protagonists do this multiple times, N.K. Jemisin writes so well that I ended up feeling (almost) nothing but sympathy for them. Broken as they are, they’re the only people with the power to change things, and they’re reasonably well-intentioned. Some of the events makes it easier to understand why people are scared of orogenes, though, and I hope there are going to be some consequences in the third book for them. Right now the main consequences seem to be that the protagonists feel bad about themselves, but that doesn’t stop them from not being in control of themselves later. Even though this was an outstanding book, it’s still very much a middle book, and by the end, the pieces are in place for what seems like it’s going to be an explosive (in multiple ways) finale. Only about six more months to wait for The Stone Sky! This entry was posted in Books, Reviews and tagged book 2, fantasy, fiction by Kriti Godey. Bookmark the permalink.